It may not sound like precision science, but researchers are hopeful that plowing a spacecraft into the moon's surface may reveal a hidden layer of frozen water beneath the surface. 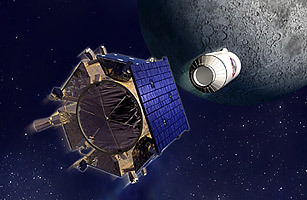 On Oct. 9, a NASA satellite will hurl a spent rocket into a dark and frigid lunar crater at 5,600 m.p.h. ; the impact will equal the force of 1.5 tons of TNT and kick up a massive, six-mile-high plume of dirt and debris. The satellite  the Lunar Crater Observation and Sensing Satellite, or LCROSS  will then photograph and study the plume for evidence of water or ice from colliding comets. After a few minutes of observation, the space vehicle will plunge into the moon's surface as well. Images taken by an Indian satellite earlier this year suggested there was indeed water on the moon; confirming the discovery would be a major boon for scientists who dream of humans inhabiting the moon, Mars and other planets someday. Can We Return Man to the Moon?